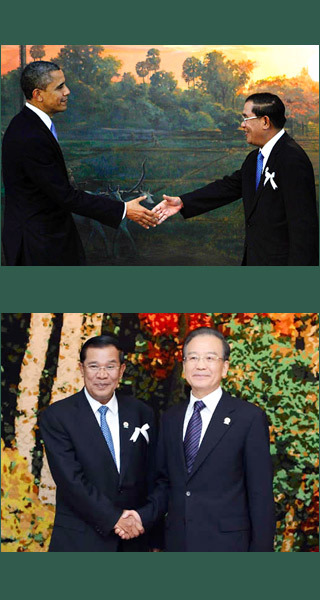 PHNOM PENH: If body language is any predictor, President Barack Obama did not enjoy his short trip to Cambodia to attend the recent East Asia Summit. The unsmiling president joined routines with other participating heads of governments his visit aimed at winning friends and influencing others against a rising China. Still, long-term US involvement in the country’s economy and security may yet produce results. Obama’s visit to Cambodia, the first by a sitting US president, was preceded by calls for him to publicly address human rights. A Human Rights Watch report released before the trip recounted the unsolved killings of around 300 labor leaders, journalists, and opposition leaders during Hun Sen’s 27-year rule. Local activists also highlighted the self-exile of opposition leader Sam Rainsy on what many say are trumped-up charges and a recent crackdown on government critics and residents protesting forced evictions. Obama seemed to stake out a middle way on human rights, discussing them behind closed doors but maintaining public silence. Not far from the Peace Palace, protesters released balloons and signs with the international distress signal, SOS, and small photos of Obama. Lao Mong Hay, a Phnom Penh–based rights activist, welcomed the president’s comments to Hun Sen, expressing hope that they might lead to new emphasis on human rights. “Cambodia cannot afford to have strained relations with the United States,” he said, adding that the country relies on the US as an export market for its garments, giving the US “strategic leverage.” In 2011, according to the Garment Manufacturers Association in Cambodia, the country exported $2.06 billion worth of garments and textiles to the US, more than half of its total; the industry employs an estimated 350,000 workers. Cambodia’s garment exports to the US also make up a massive proportion over its overall exports, which totaled $4.87 billion last year. This stands in contrast to the wide trade deficit with China. In 2011, the $2.5 billion in two-way trade between Cambodia and China consisted overwhelmingly of imports of Chinese machinery, electronics, food, cars and medicines. In return, Cambodia does China’s bidding on a range of issues. It has deported to China Uighur asylum seekers, given vocal support to the One-China Policy and backed China’s position on negotiations over the South China Sea dispute. Two large green banners welcomed visiting dignitaries to Phnom Penh’s Peace Palace for the summit meetings, listing one leader and one country: “Welcome Prime Minister Wen Jiabao!” proclaimed one banner. “Long Live the People’s Republic of China!” read the other. Hun Sen has played this game for years. US-Cambodia relations have steadily improved since July 1997, when he overthrew co–prime minister, Prince Norodom Ranariddh, in a violent coup de force. But as Hun Sen consolidated power in the early 2000s, Washington began to reengage. In August 2005, restrictions on US military assistance to Cambodia were lifted; in 2007, the US resumed direct foreign assistance, making Cambodia the third largest recipient of US aid in East Asia after Indonesia and the Philippines. This renewed commitment was symbolized by the December 2005 inauguration of a new $47 million US Embassy complex in Phnom Penh. Then came the Obama administration’s pivot to Asia. In 2009, Cambodia and the US exchanged defense attachés, and Defense Minister Tea Banh visited Washington for talks about building up ties between the US military and the Royal Cambodian Armed Forces (RCAF). Angkor Sentinel, an annual joint US-Cambodian military exercise, was inaugurated in 2010, and three days before Obama’s arrival last week, Defense Secretary Leon Panetta met with Tea Banh in Siem Reap and reaffirmed US military commitment to Cambodia. According to Carl Thayer, the US is building relationships with those considered to have influence now and in the future. Casting its eye to the longer term, the US also moves to establish strong relationships with Hun Sen’s eldest son and heir apparent. Hun Manet was given a place at West Point military academy, graduating in 1999. The 35-year-old is a RCAF major-general and commands the National Counter-Terrorism Special Force established with US assistance in 2008. The chilly visit may strain relations, but in the long-run, the two countries will likely see benefits of closer ties. For the US, there is the need to offset a rising China, forcing the former to take a patient approach on human rights issues. For Cambodia, as always, there is the weight of history as a small nation vulnerable to powerful outside forces. It may be that as China’s influence grows Hun Sen will recall an adage often cited by Prince Norodom Sihanouk as he struggled to maintain Cambodia’s neutrality during the Cold War: “When two elephants fight, it is the grass that suffers.” In the end, the economic and military weight of the US may persuade Hun Sen and his successors to slide towards a more balanced position. Sebastian Strangio is a journalist based in Phnom Penh, Cambodia, covering Asia.